The HEX Slim Watch Band for iPod Nano Gen 6 turns your iPod Nano into an iWatch! Features include a premium silicone strap with adjustability that accommodates smaller wrist sizes, color-matched ABS buckle for adjustability, “Pop-in, Pop-out” design, a double-gasket to securely hold your Nano in place, integrated control buttons built right into the strap, and an integrated audio port cover with inline orientation. The Slim Watch Band comes in 4 colors including Black, White, Pink and Purple. TikTok and LunaTik by MINIMAL are the latest “iWatch” wristbands that allows you to transform your iPod Nano Gen 6 into a watch. TikTok is a simple snap-in design made from high grade silicone rubber with soild stainless steel hardware. The LunaTik is a premium conversion kit that secures the iPod Nano in a two-piece CNC-machined aluminum case held together with stainless steel bolts. You can pre-order the TikTok which sells for $34.95, and the LunaTik which sells for $69.95. SwitchEasy is the latest company to get on the iWatch train. The new Ticker for iPad Nano 6G is made from a specially developed Elastomer material with a stainless steel strap pin. The highly durable polycarbonate push through buttons provide the ultimate tactile response. Included in the pack is a Ticker unit, two ant-static screen guards, a microfiber wipe and a squeegee for your screen guard application. The Ticker strap gives you a whole new way to interact with your iPod Nano. Griffin is the latest company to get on board the iWatch train. The Slap wristband for iPod Nano Gen 6 is a fun and colorful way to turn your iPod Nano into an iWatch! The flexible spring-steel band wrapped in soft silicone snaps easily and securely around your wrist. The wristband frame covers the volume and sleep buttons but still allows touch control of your iPod Nano. Turn you iPod Nano Gen 6 into an iWatch! 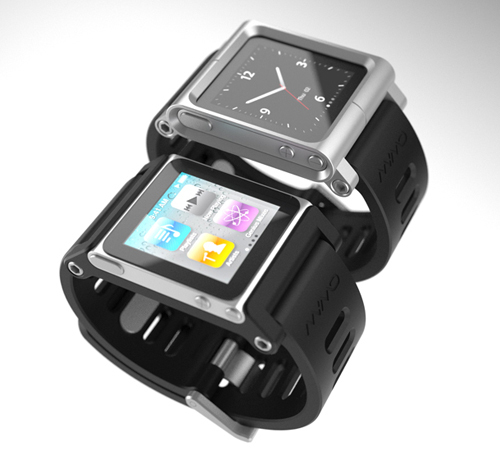 HEX has a new watch band especially designed for iPod Nano Gen 6. 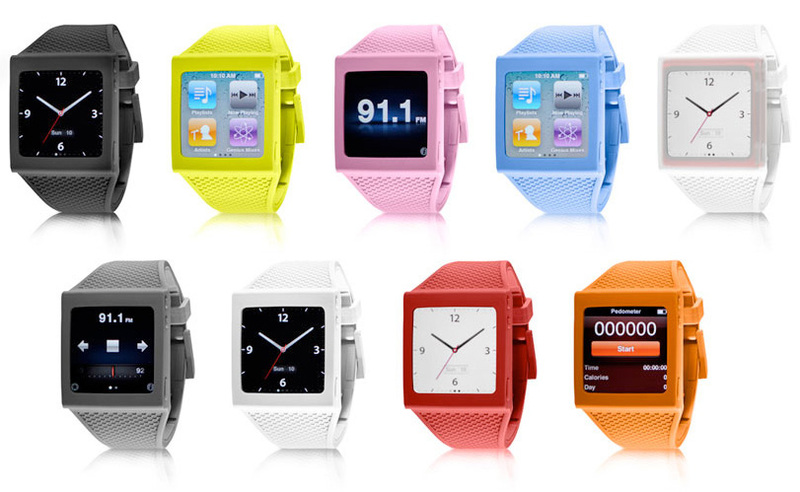 The premium silicone strap protects your iPod Nano and turns it into a watch at the same time. The pop-in pop-out design makes it easy for you to insert and remove the iPod Nano.